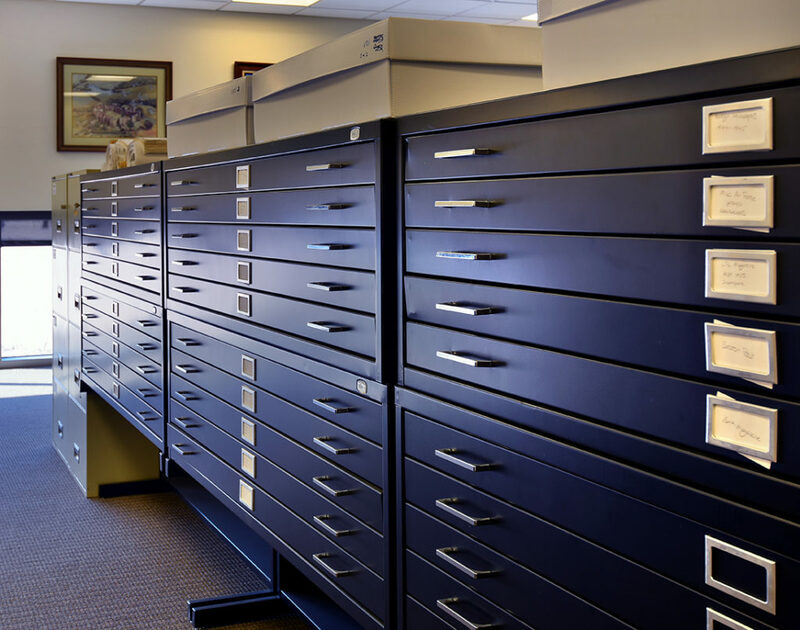 Shown Above: In addition to its public exhibit spaces, the 390th Memorial Museum holds thousands of photos, records, and objects pertaining to the 390th Bombardment Group (H). These files, maintained within the Joseph A. Moller Library, contain hundreds of period maps, newspapers, and other large WWII documents. The 390th Memorial Museum has been selected to participate in the Museum Assessment Program (MAP), which is administered by the American Alliance of Museums (AAM). Through guided self-study and on-site consultation with an assigned museum professional, participation in MAP will empower the 390th Memorial Museum to better serve the public by meeting and exceeding the highest professional standards of collections management in the museum field. The museum’s participation is made possible through funding provided by the Institute of Museum and Library Services (IMLS). MAP helps museums strengthen operations, plan for the future, and meet standards through self-study and a consultative site visit from an expert peer reviewer. “The MAP program will help the 390th Memorial Museum increase our stakeholder’s knowledge about collections standards and best practices, improve the alignment of our collections with our mission and institutional plan, and improve the museum’s ability to create a collections plan,” said Mariel Watt, the 390th Memorial Museum’s Archivist & Curator. Since its creation in 1981, the MAP program has served over 4,600 museums. MAP is supported through a cooperative agreement between AAM and IMLS. For more information, including a complete list of museums participating in MAP, please visit www.aam-us.org/map, call 202-289-9118 or e-mail map@aam-us.org. AAM is the only organization representing the nation’s entire museum community and has been dedicated to promoting excellence within the museum field for over 100 years. For more information about AAM, visit www.aam-us.org. The Institute of Museum and Library Services is the primary source of federal support for the nation’s 123,000 libraries and 35,000 museums. To learn more about the Institute, please visit: http://www.imls.gov.